Around this time last year Zambia, Africa's top copper producer, was feeling the chilling effects of the global economic recession. A slump in copper prices on the international market and the subsequent closure of mines rendered thousands of people jobless as the government's revenue base shrunk. Mining forms the country's main economic backbone and accounts for 70% of country's foreign exchange earnings. 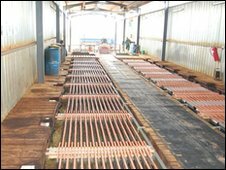 Zambia's revenue earnings from copper sales last year tumbled to $2.9bn (£1.88bn) from $3.6bn recorded in 2008, representing an 18% decline. This is despite output increasing by 20% over the same period, according to official statistics. "We are recovering as a country because we are seeing increased exploration activities," says mines minister Maxwell Mwale. "Exploration guarantees the future of the mines and a number of our people are being employed." Indeed, there is something of a boom in the mining sector. The central bank says copper production last year jumped to 675,384 tonnes from 587,125 tonnes the previous year. At the peak of the recession many western investors either fled or scaled back their presence in the copper belt - leaving the economy hurting. The departure of the western investors at the height of the recession saw Chinese investors taking up the abandoned positions. Yet observers argue that Chinese investors were the only people to operate mines on the downturn as their investments were backed and guaranteed by their sponsoring government - China. Last year alone, China invested over $400m into Zambia's mining industry. But as the international climate improves so too have prices. The mines are now back in business and the copper belt region is once again thriving. A staggering $3.6bn beckons in mining-related activities in north-west Zambia. including a 150,000 tonnes-a-year copper smelter that has been developed. The facility is meant to offer smelting facilities to emerging mines, especially in north-west Zambia. Despite observers viewing China as a country that is just interested in reaping Africa's resources, some local mining entrepreneurs think Chinese investment into the mines is good for Zambia. "Copper is a long-term cycle. You don't just invest today like you bake bread in the morning and sell in the evening," argues Phesto Musonda, a local mining entrepreneur. "Who doesn't need China as a long term investment partner? The whole world is focussing on China, including America." Not everyone is in agreement with Mr Musonda. Bob Sichinga, a leading business consultant and a former local legislator, argues that investment into Zambia, regardless of its source and nationalities behind it, should also benefit the locals. "No one should tell us they have come to help Zambia when they have to come to help themselves," he says. "If anyone is going to make resources available, they ought to get a reward from it and I don't have a problem with that. "What I have a problem is where that investment doesn't leave any lasting benefit to the country," he says. He argues that the duty to protect national interests squarely lies on the shoulders of government. Mr Sichinga is further unhappy that the "Chinese have the poorest" safety record for their employees in the mining sector. 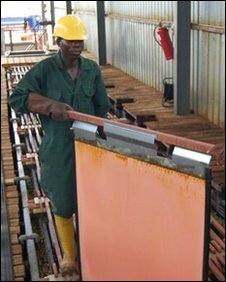 Perhaps his observations are timely because Zambia is on course to produce the anticipated one million tonnes of finished copper cathodes, or plates, by next year. But the government says it will continue providing a fair investment environment for everyone. However, mines minister Mr Mwale admits the Chinese have positioned themselves well against their competitors. "China is resource hungry and at the time we were privatising the mines, they took up the least attractive ones which they have turned around," he says. He adds that the Chinese have proved to be "our all-weather friends" because when other investors were "fleeing" they re-assured Zambians of their jobs. Only time will tell if Chinese investment in the mining sector is good for Zambia. Africa Business Report is a monthly programme on BBC World News. The next programme will be on Saturday, 20 February, at 0330 GMT and 1830 GMT, and on Sunday, 21 February, at 1130 GMT as well as 1830 GMT.